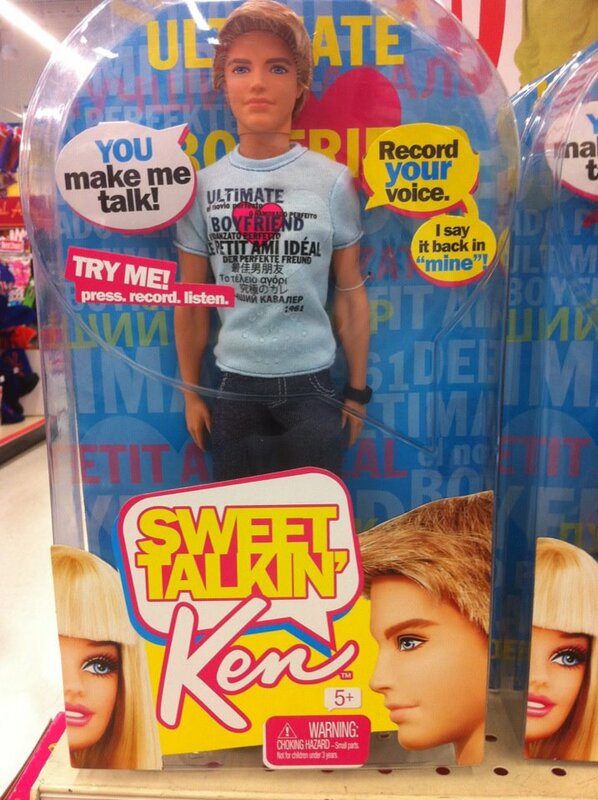 Does every girl need a Sweet Talkin’ Ken? I’ve been seeing a counsellor for a couple of months. It started because I was having a truly awful time at work and ended up being signed off with stress, and my occupational therapist had recommended counselling: but of course given recent developments in my life, the counsellor has become more valuable and important to me than I could have known. Last week we moved on from picking over the details of what had gone wrong and how it made me feel, and started talking more about the future. I’m pleased to say I’m generally very optimistic about what lies ahead. I feel like I’m already getting my life back on track and reclaiming my house, my happiness and my sanity. However, my counsellor asked how I felt about the idea of future relationships, and suddenly the solid foundation I had started rebuilding began to feel shaky and unsteady. I answered that I had all I needed in my children, my family, my friends and my home, and that the thought of another relationship couldn’t be further from my mind. My counsellor dug deeper. I began to explain, tentatively, that I have lost all confidence in my ability to choose a relationship that is good for me. Looking back I could see that time after time I have made bad choices, and formed relationships with people who are, quite clearly, not right for me. I took a deep breath, then dug deeper still. And as the session went on, I had an epiphany. I suddenly realised that my sense of worth – my own measure of how interesting, attractive and funny I am; my perception of how much I am wanted – has always come from men. As a teenager I very much wanted a boyfriend. I thought being someone’s girlfriend was a way of showing the world (and myself) that I was important and desirable. And after some perseverence on my part, the boyfriends started, followed in later years by three fiances and an eventual husband. My counsellor asked whether I had ever stopped to ask myself how I really felt about each of these men, and the honest answer is no. Time and time again I have got so caught up in the excitement of a relationship, and been so delighted that someone wants to be with me, that I’ve not taken the time to examine my own feelings. But why? My inital reaction is that this clearly points to low self-esteem: it suggests that I am “grateful” for someone’s attention and grab it with both hands. But this explanation doesn’t feel right. I don’t believe my self-esteem is particularly low. If anything I was a confident, extroverted teenager, and while the gregarious side of my nature has lessened a little over time, I still feel that in many ways I am confident in myself and my abilities. So why then? Why have I sought approval and attention from males for as long as I can remember? I was at a loss to explain this … until this afternoon. Yesterday I finally completed the redecoration of my 3-year-old daughter’s new bedroom, and I went to Toys R Us today to buy her a reward for staying in her new bed all night. It was here that I came across “Sweet Talkin’ Ken”. This doll proudly wears a t-shirt emblazoned with the words “Ultimate Boyfriend” in a variety of languages. The owners of this doll are expected to press the heart on Ken’s t-shirt and whisper sweet nothings into his ear which he will repeat back, in his own voice. The recommended age on the box? 5+. Little girls from the age of 5 (and it is not unreasonable to suppose it will be mostly girls taking Sweet Talkin’ Ken home with them) are clearly not only expected to want a boyfriend, but to know what he will say to them too. And he’s not just any old boyfriend; oh no. As any discerning 5-year-old will tell you, she needs to have the ultimate boyfriend. It simply astounds me that this disturbing doll and its horrific packaging are seen as OK. The message that this toy gives to young girls is nothing short of terrifying. Before they have even left primary school, girls are expected to want the perfect boyfriend who always knows what she wants to hear; and are equally expected to respond to him with coy flirtatiousness. Which all leads, in my journey of self-discovery, to the question: was I subjected to these kinds of influences as a child? And of course the answer is a resounding “yes”. For as long as I can remember I have adored Disney films. And what did I learn from them? Cinderella’s step-sisters only recognise that she is someone to be respected when her handsome prince comes to save her from the drudgery of her former life. Aurora in Sleeping Beauty is saved from her coma by her prince’s kiss; no doubt to then, in her overwhelming gratitude, devote her life to being the perfect wife. In the Little Mermaid, Ariel falls instantly in love with Prince Eric despite knowing nothing about him, and then like Sleeping Beauty, must wait for her prince’s kiss to save her. And there we have my answer. Since I was a very young child I have received messages telling me that I need my own prince in order to feel valued and loved; just like little girls now are being told they need the ultimate boyfriend. Last week my counsellor uncovered the fact that I have never taken the time to examine my own feelings for someone before jumping into a relationship: much like Cinderella, Aurora and Ariel I have been happy to wait for a man to tell me I am important and to show the world I am of worth. Phew. That’s quite an epiphany. So what am I going to do about it? I’m going to darn well sweet-talk myself. I ‘m going to try to focus on the things I do well, and the things I’m proud of. I’m going to try to be happy with who I am and what I have. I’m going to remember that my life is full and happy and often pretty darn wonderful without needing a man to validate me. I’m going to try to bring up my own daughter to be confident and strong, and to know that there are no limits to what she can achieve alone. I’m going to question the fact that the bedroom I’ve just completed for her is a Disney Princess themed room …. oh dear. Well at least I can take a little comfort from the time I spent getting to know Sweet Talkin’ Ken in Toys R Us today. Once I had worked out how to record Ken’s message I set to work on the three Ken dolls remaining on the shelves. And so I can’t help smiling when I think about the fact that the next three little girls to take Ken home will hear his deep masculine voice saying “I respect you for being a strong, independent woman. Of course I will support you in your career. There’s nothing you can’t do”. Aaaah, my work here is done.